Suppose we are given a function of boolean arguments that returns a boolean result. Alice has bits, and Bob has another bits . Alice and Bob are widely separated and don't know each other's bits. What is the total number of bits that Alice has to send to Bob and that Bob has to send to Alice so that between them they can compute ? Think about how complex might get. The and might each describe half of a "voxelised" region of space and might answer a question about a computational fluid dynamics (CFD) simulation running in that space. CFD simulations can be chaotic and so we might expect that in the worst case many bits have to be transferred back and forth between Alice and Bob. In the worst case we might expect that Alice has to send Bob all of her bits, or vice versa. But in fact Alice needs to send Bob just one bit. To get the communication requirements down to one bit we need to use a loophole. But I hope to (1) justify the cheat to some extent and (2) justify that it's even worthwhile to think about cheats. Alice and Bob have access to some Ancient technology. They each have one of a pair of boxes. At prearranged times, Alice puts a bit into her box, and Bob puts a bit into his box. A bit pops back out of Alice's box and a bit pops back out of Bob's box. Whatever the input, both Alice and Box have a 0.5 chance of seeing a one or zero pop out of their respective boxes. But when the two outputs are XORed together the result is the logical AND of the two inputs. With such boxes, Alice can compute after Bob sends a single bit down a conventional communication channel. "But this is a total cheat!" you complain before I even start to explain their technique. It seems Alice receives a bit that depends on what Bob input, and so Bob is communicating with Alice. But look closely and you'll see that the boxes don't allow any communication. No matter what Bob inputs, Alice has a 0.5 chance of getting zero or one. There is no way Bob can use this to communicate anything. It's like intercepting a message encrypted with a one time pad. Without the pad, the message is basically a sequence of random bits. Nonetheless, it is true that the outputs that Alice and Bob see are correlated. I hope I've convinced you that Alice and Bob can't send any bits with these boxes. Despite this, it is pretty clear that the behaviour of the boxes is non-local. We'll call any kind of boxes that allow instantaneous long range correlations that can't be explained by purely local behaviour non-local boxes. Boxes that can't be used for message sending are called non-signalling local boxes. And the particular non-local box I describe above is called a PR box (eg. see here). Any single bit boolean function of a finite sequence of bits can be written as a polynomial modulo 2. Each monomial in the polynomial can be written as a product of terms involing just the and terms involving just the , ie. where depends only on the , depends only on the and is drawn from some finite set. Alice can compute the and Bob can compute the . Now Alice and Bob, in parallel, feed and respectively into their PR boxes. We know that we could evaluate each term in the sum we want by adding Alice's output to Bob's output. But that would require sending one one-bit message for each . But we don't need each term one by one; we just want the sum. 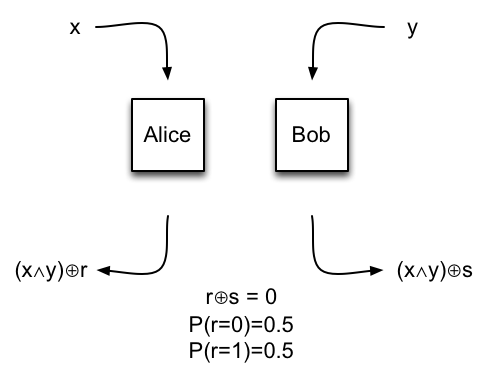 So Alice and Bob can individually sum their separate outputs knowing that adding Alice's output and Bob's output modulo 2 will be the correct sum. So Bob sends his sum to Alice. Alice adds that number to her own (modulo 2) and that's the value we want. Only one one-bit message was sent. Non-local boxes don't exist, do they? So why are we talking about them? Actually, non-local boxes exist both theoretically and in the lab. Non-local correlations in quantum mechanics allow them to be constructed. But for this article I wanted to abstract from quantum mechanics and talk about the behaviour of a non-local box without getting my hands dirty with the details of quantum mechanics. Having said that, although non-local boxes do exist, the special case of the PR box can't in fact be constructed with quantum mechanics. In some sense it allows correlations that are "too strong". An article I wrote a while back describes the closest you can get to building a PR box with quantum correlations. Curiously, if you restrict yourself to the kind of non-local box quantum mechanics allows you to build you find that some functions can still be computed with less communication than you'd need if non-local correlations are disallowed. Nonetheless, the worst case scenario with QM still requires the sending of bits. There are a couple of papers about universes where PR boxes can be built; so called boxworlds. There is a lot of interesting theoretical work in characterising quantum mechanics. In particular there are a number of theorems and conjectures that describe QM in the form "the most X theory that doesn't allow Y" where X is an interesting property and Y is something you'd like to do. I learnt all of this from the paper Implausible Consequences of Superstrong Nonlocality by Wim van Dam. (+ being xor) which I don't think is what you want; did you mean to have (x^y)+r come out of one box and s out the other, so that summed they would add to (x^y)? The text doesn't drfine what is "r" and what is "s". Also it isn't clear, how the complete function will be computed. What stops us defining Truth? Shuffles, Bayes' theorem and continuations.